It’s a fine ten years in the making. 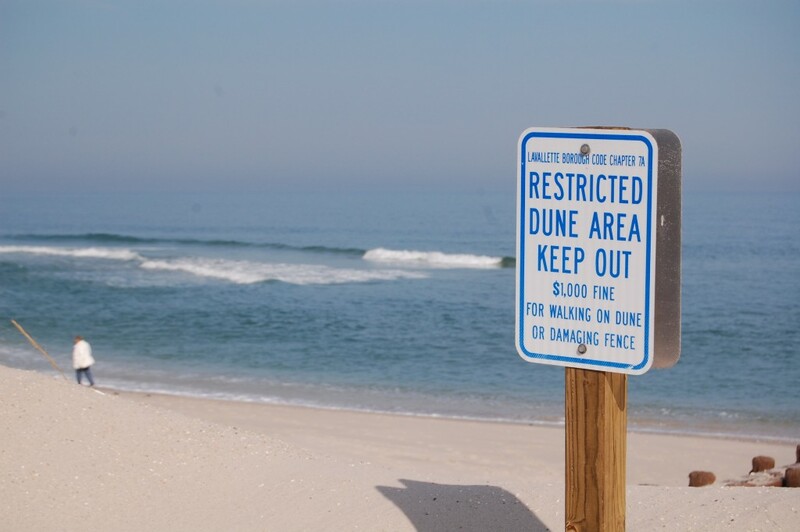 When Lavallette officials, in 2007, created dune walkovers from two gazebos along the boardwalk, they inadvertently violated a state permit allowing the town to maintain its dune line. Whether a call came from a resident or a state Department of Environmental Protection inspector caught the violation, Lavallette taxpayers were hit with a six-figure fine that was, after rounds of back-and-forth, ultimately negotiated down to $36,000. In the midst of the negotiations over the fine, Lavallette agreed to place signs along the beachfront and bayfront as a condition of a settlement with the state. The signs were to explain the sensitivity of the coastal environment and give tips about protecting dunes and other species. Lavallette officials had most of the signs made up, but the state – busy with Sandy recovery – never enforced the obligation to display them. Recently, Mayor Walter LaCicero said, the state came calling for the signs to be installed. “We dug up the old signs that we prepared, and the letter did come back saying that, yes, everything is fine,” said LaCicero. Initially, the signs will be installed at the bayside. After an upcoming beach and dune replenishment project is completed, the oceanfront signs will go up. “I guess they’re finally slowing down,” LaCicero said of the DEP.